We are in need of power in the spiritual life. Here is a devotion full of power because Mary’s Immaculate Conception was a spiritual revolution in human history. It was a revolution because it brought forth a human being no longer contaminated by sin (Mary), who was fit to be the mother of the Savior of the world (Jesus). It is the Saints themselves who understood the marvelous union of Mary and Jesus. In my previous post I outlined doctrinal and scriptural bases for the dogma of Mary’s Immaculate Conception. In this follow-up post, which is essentially a postscript to that note, I touch briefly on the importance and efficacy of increased devotion to the Immaculate Conception. Mary entered human existence by a remarkable grace that preserved her from original sin, and which set her apart to become the Mother of God and the harbinger of God’s own human existence in the person of Jesus. 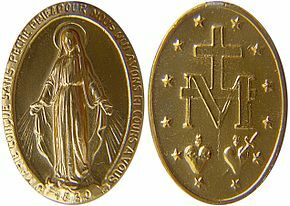 Mary’s Immaculate Conception thus warrants a special devotion, and wearing the Miraculous Medal (first called the medal of the Immaculate Conception), and saying the prayer each morning, “Oh Mary, conceived without sin, pray for us who have recourse to you,” is one way to effectively practice this devotion. Saints who have been devoted to Mary’s Immaculate Conception include Saint Catherine Laboure (the nun who received the Miraculous Medal devotion from the Virgin Mary), Saint Bernadette, Saint Maximilian Kolbe, and Blessed Mother Teresa (whose nuns have given out millions of Miraculous Medals). Note: A short but powerful prayer invoking the Immaculate Conception is: “Oh Mary, by thy Immaculate Conception make my body pure and my soul holy.” The tone and content of this note owing to the writings of Father Faber, and in the first two sentences I am copying him. Photo attribution: The photo above is by Xhienne, May 18, 2007, “Medal of the Immaculate Conception,” at Wikipedia, available under a Creative Commons Attribution-Noncommercial license. Great post Uncle Tommy !